Since her Dad's tragic death, Lexie's Mum has spiralled deep into addiction. Every morning, Lexie hovers near her mother's sleeping form, hoping she has survived another night. There's rarely money for food and even catching the elevator from their high rise housing commission flat can be fraught with danger. But Lexie is a survivor. When a little dog's remains splatter the pavement and Lexie witnesses the outpouring of an old man's grief, her world shifts. Lexie rejects the idea that this broken man could ever live up to his nickname, the Creeper. Soon after, a chance sighting on the commission's rooftop, a life-or-death encounter and a messy apartment give Lexie new purpose. She talks her best friend Davey into joining her quest to help an old man and together the three plant new seeds of hope. Little do they realise their actions could lead to a journey where dreams are both fulfilled and destroyed. With an old car for transport, a visit to Beechworth prison and the police on their heels, the action keeps unfolding. Mr Romanov's Garden is gritty yet funny, heartfelt without a moment of soppiness and very real. Sharing Lexie's journey was like breathing new air. She showed me unexpected scenes, introduced me to new insights and let me inside her heart. Stories like Lexie's are rarely palatable for preteens, yet so many live her experience. 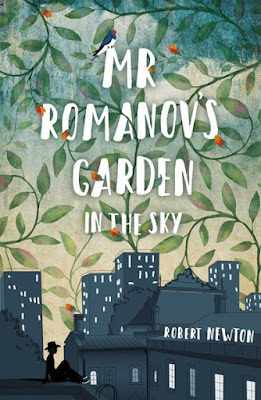 I sincerely hope Robert Newton continues to open previously closed doors for 10 to 14-year-olds with more powerful yet poignant Middle Fiction titles like Mr Romanov's Garden in the Sky.